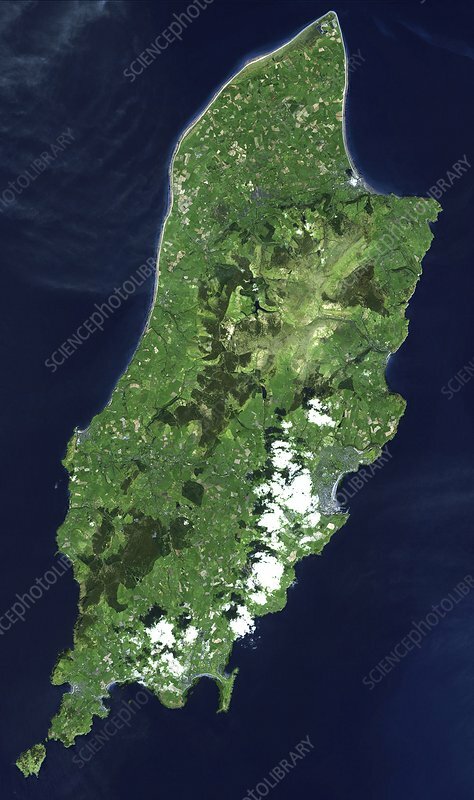 Isle of Man, satellite image. North is towards top left. Visible features include fields and hills (shades of green), beaches and clouds (white), lakes and reservoirs (dark blue), and urban areas (grey). The Isle of Man is a self-governing British Crown Dependency in the Irish Sea between Great Britain and Ireland. It has been inhabited since 6500 BC, with a current population of around 85,000. It is 52 kilometres long, and 22 kilometres wide at its widest point. The capital and largest town is Douglas (lower right). Image obtained by the Advanced Spaceborne Thermal Emission and Reflection Radiometer (ASTER) on NASA's Terra satellite, on 1 May 2001.